Smart looking, Smart wearing. 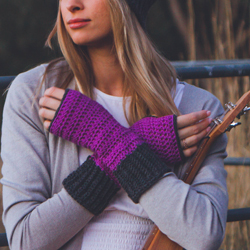 BE SMART in these Mitts designed for comfort, warmth and style. Called ‘Be Smart’, because you will look ‘smart’ and stylish wearing these gloves. Comfort is paramount. The cuff is snug, but not tight, and the glove firm around the hand. Starting with the sideways rib, the construction can be achieved without any cut yarn until the last trim around the thumbs. The Be Smart Mitts Crochet Pattern has been tested by independent crocheters (some of their amateur photos are in the gallery). The Be Smart Mitts are also available as part of the Be Smart Set. The set also includes the Be Smart Slouch. The 100% Extra Fine Merino Superwash yarn creates a super soft, pliable fabric which is perfect to assist with the stretch and fit of the gloves. Foundation Double Crochet (Fdc) – can be substituted for ch +1st and Dc row, if you prefer.